Perhaps the most overlooked and forgotten man in Scottsville's history is Colonel Henry Gantt, who lived at Valmont on the hill above the town during the 19th century. Henry's grandfather Henry Wright Gantt moved to Albemarle in 1813 from Berkeley County, Virginia (now West Virginia) and purchased a place called Solitude near North Garden. Henry Wright Gantt's residence in the area was short-lived however, because of an extraordinary event in his life. On December 21, 1821 he won, what was then, the princely sum of $40,000 in the Maryland lottery! Soon after acquiring that windfall, he gave the North Garden property to his oldest son Dr. John Weems Gantt and returned to his original family home in Maryland. After formally inheriting the Solitude property in Albemarle in 1830 from his father, John Weems Gantt bought 7991/2 acres near Scottsville in 1835 from Charles A. Scott. The tract was located just up-river from Scottsville, and was bounded on the south and east by the James River and on the north by Totier Creek. Scott identified the tract as his "Upper Plantation," but Gantt re-named it Oakwood and established his primary residence there. Most of the Scott land in that area was part of the original 1729 Dr. George Nicholas' 2600-acre patent. Shortly after his move to Oakwood, Gantt sold Solitude to Joseph Sutherland. 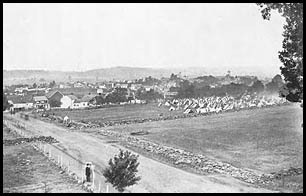 The history of Scottsville and Albemarle County is inseparable from Valmont. 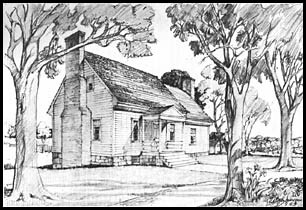 According to local tradition, the first house at Valmont, located on Route 726 about a mile southwest of town, was allegedly built there on the original 1732 Edward Scott patent by Daniel Scott, and served as a temporary courthouse until a permanent structure could be erected on the property in 1745. However, more recent architectural research suggests that the present restored frame dwelling probably was not built until at least the first quarter of the nineteenth century. Whatever the precise origin of today's Valmont house, little or no uncertainty exists about the historical significance of this site, located on the bluffs overlooking the Horseshoe Bend, as the approximate location of Albemarle's first seat of government. By 1852 with the purchase of these three properties, Dr. John Weems Gantt owned nearly 2000 acres of prime farmland that extended from Valmont on the edge of Scottsville south and west up the river to beyond present-day Hatton. His Oakwood estate must have been quite substantial. A descendant vividly described the grounds as "a road bordered on each side with osage orange trees, and from the yard of his residence, Oakwood, he had avenues of trees to various points, an overseer's house, etc. on his plantation. He was a man of great liberality, taste and refinement and spent much time in beautifying his home. His yard was a thing of beauty with its lovely flowering shrubs and rare trees." Unfortunately, the place is said to have burned in 1871 and all the family's records and memorabilia were lost. When John Weems Gantt died in 1860, he divided his land among his three sons: Oakwood and the adjacent Harris property were given to his two youngest sons Price Perkins Gantt and Thomas Perkins Gantt jointly, with Thomas settling into the original Oakwood residence, while his older brother Price established his home at a nearby place called Hayfield. Neither of the latter two homes exists today. The oldest son Henry was given sole title to the 508 acres at Valmont. It is Henry who is the prime subject of our interest. Henry Gantt was born in 1831, probably at Solitude, the son of John Weems and Sarah Blakey Perkins Gantt. He enrolled at Virginia Military Institute in 1848 and graduated in 1851, ranking 23 out of a class of 29. Henry returned home from school and apparently farmed his father's land at Valmont during the 1850's. But the John Brown raid at Harper's Ferry in late 1859 ignited passions throughout Virginia and the South, and numerous local volunteer military companies were formed. The Scottsville Guard formed about this time, and Gantt, with his V.M.I. credentials was likely named captain and commanding officer. Virginia seceded from the Union on Wednesday April 17, 1861, and volunteer companies from all over the State were quickly mobilized. The Scottsville Register of Saturday April 20, 1861, gives a stirring account of local events of that week: A telegraphic dispatch was received by Captain Gantt on Wednesday evening last [April 17] requesting him to have his company in Charlottesville by 9 o'clock that night. A messenger was immediately dispatched to Captain G. four miles in the country. In not more than two hours fifty members of the Scottsville Guard were parading our streets, muskets in hand and knapsacks on back, ready and anxious to respond to the call. We are personally acquainted with every officer and every member of the Scottsville Guard, and feel warranted in asserting that a braver and better set of men never graced a military corps. 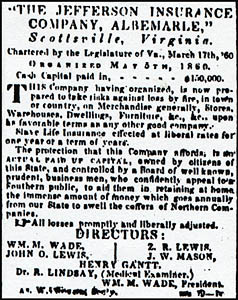 Though only about 30 at the time, Henry Gantt's position and reputation in the community was further demonstrated on the same front page of the April 20, 1861, issue of the Scottsville Register in an advertisement for the newly-founded "Jefferson Insurance Company of Albemarle." The announcement listed the company's "cash capital paid in" assets at $150,000, and identified the following directors: Wm. M. Wade, John O. Lewis, Z.R. Lewis, J. W. Mason, Henry Gantt, and Dr. R. Lindsay, Medical Examiner. The Scottsville Guard, an independent company, was soon incorporated into the 19th Virginia Infantry Regiment as Company C with Henry's half-brother Albert W. Gantt being named Captain. The 19th Virginia was composed of men from three counties -Albemarle, Nelson, and Amherst, with the large majority being from Albemarle. Henry Gantt was officially commissioned Major of the regiment on May 17, and promoted to Lt. Colonel on April 29, 1862. The 19th Virginia saw action at 1st Manassas in July and was heavily engaged in the Peninsula campaign east of Richmond in the spring of 1862 where Colonel Gantt was singled out for commendation by his brigade commander General George Pickett for his service. Gantt was said to have been wounded in the hip on August 30 at the Second Battle of Manassas and apparently did not participate in the Maryland campaign the following month. Colonel John Bowie Strange of Charlottesville, commander of the 19th Virginia, was killed in the battle at Tuner Mountain near Boonesboro, Maryland on September 14, 1862, after which Henry Gantt was promoted to full colonel replacing Strange. On the afternoon of July 3, 1863, Henry Gantt bravely led the regiment, at the time assigned to Garnett's Brigade of Pickett's Division, up Cemetery Ridge in the battle of Gettysburg in what is arguably the most famous charge in American history. One report says that he was "severely wounded in his face and all his teeth were shot out," while another account states that he was also wounded in the shoulder "but was fortunate enough to be carried off the field of battle." In an amazing feat of logistical efficiency by the Army of Northern Virginia, the badly wounded Gantt was transported nearly 200 miles from Gettysburg to Charlottesville by wagons and other means and admitted to the Confederate Hospital on July 10. Two days later he was transferred to the Scottsville Confederate Hospital to be closer to his family at nearby Oakwood. There is no record of Henry in the extant records of the Scottsville Hospital, but his wounds were obviously debilitating, forcing him to spend considerable time on furlough at home and in and out of several hospitals until the end of the war. He may have briefly returned to the regiment in late spring or early summer of 1864, but for most of 1864 he was officially listed as "at home on sick furlough," or "absent sick." However, when his health permitted, he returned to active duty and in late 1864 and early 1865 took command of both the 19th Virginia and Hunton's Brigade for short periods on the Bermuda Hundred and Petersburg lines. His last official record shows him in two hospitals in Richmond on March 17-18, 1865. He was paroled at Columbia on June 1, 1865. Though badly wounded during the Civil War, Henry Gantt returned home after Appomattox and attempted to get on with his life at Valmont. In addition to overcoming his severe physical disabilities, he had to cope with the economic wreckage in the aftermath of the Civil War. Devastation was all around him - the James River and Kanawha canal was in ruin, much of Scottsville and surrounding communities and homes had been destroyed, everyone was destitute, much of the land lay in waste, most of the livestock had been lost, there was no way to cultivate the land, and starvation was a constant companion. A year or so after the war Henry married Martha (Pattie) Burke Eppes of the distinguished Buckingham County family. The couple had 3 daughters - the first, Sallie lived only 19 years, the second Tempie was declared legally insane in 1891, and then Fannie who apparently died as an infant. The Gantts were staunch Episcopalians. 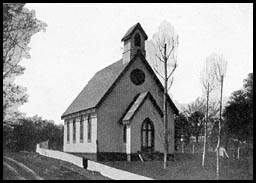 In 1861 Bishop Meade, for example, commended the family for their long-standing support of St. Anne's Parish, and Henry played a major role in founding St. John's Chapel (to become St. John's Church) in Scottsville in 1875. Numerous Gantt children were baptized or confirmed in St. Anne's Parish, and indeed, Elizabeth Jefferson Gantt, Henry's half-first cousin, was recorded as the first person baptized in St. John's Church on July 24, 1875. The saga of Henry Gantt and his brothers' financial distress after the war would fill several voluminous ledger books. As early as 1870 Henry was forced to borrow working capital to enable him to carry on farming operations. He repeated the procedure numerous times for the next 14 years in an attempt to survive. The Gantts, like others in the community, were rich in property, but poor in specie. To survive, they had borrow repeatedly to buy live stock or just for seed money to plant crops and hope to make enough on the next harvest to survive, and then hope to pay off the debts, and then borrow again to start the cycle over. The only security they had for their loans was their land. As a result, the 1870-1880 deed books are full of transactions showing both their real and personal property being "deeded in trust" to various creditors to secure loans. In the end, either because of the general economic conditions in Virginia following the Civil War, and/or inept management on the part of the Gantts, the family lost all their Albemarle land. A descendant summed up Henry Gantt and the family's demise by saying that "through the reverses of war and fortune, all is now in the hands of strangers." Henry Gantt never recovered from the severe facial wounds he suffered at Gettysburg, and he died October 4, 1884, while on a trip to Buckingham White Sulphur Springs near Curdsville. He apparently visited the Springs numerous times after the war to take advantage of the alleged therapeutic and restorative properties of the warm mineral-rich waters. Henry was hopelessly in debt at the time of his death, and in 1886 the court ordered Valmont auctioned to pay off the numerous creditors. His indomitable wife Pattie tried valiantly to save the farm, but she too failed, and in 1891 the court again ordered the property sold. At that time D. H. Pitts and William Dorrier of Scottsville purchased Valmont and ownership by the Gantt family finally ended. Perhaps as a saving grace from her misery, Pattie died the year before the sale was consummated. It has not been definitely proved, but Henry Gantt and his family are all probably buried at Valmont. 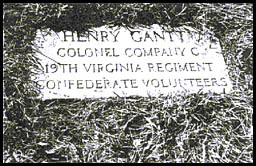 However, the only evidence of a cemetery there is an obscure and solitary black granite marker set in a pasture near the present house that reads: "Henry Gantt, Colonel Company C, 19th Virginia Regiment, Confederate Volunteers." The marker was probably emplaced by the S cottsville Chapter of the United Daughters of the Confederacy sometime in the 1920's or 30's. The only other remembrance to the man in Scottsville is on the central obelisk in the Scottsville Confederate Cemetery where his name is listed along with others of the community, who served in the Civil War. We know very little about Henry Gantt's personal life, not even a photograph of him is known to exist, but his record suggests a distinguished man of great strength and discipline, who suffered grievous war injuries and then made a valiant attempt to survive the economic adversity in the aftermath of the war. He and his family grew and prospered in the antebellum era, but like many of his contemporaries, he was overwhelmed by the apocalyptic watershed of the Civil War. Henry Gantt deserves recognition as one of Scottsville and Albemarle's prominent sons. Perhaps his most appropriate epitaph was written in the Scottsville Register on April 20, 1861, as he led his men off to war: No Captain of any Company in Virginia commands more respect and high esteem than does Capt. Henry Gantt. Many thanks to Richard Nicholas for his keen interest in Scottsville's Civil War history. Special thanks to Robert Spencer for detailed editing and to Gwynne Daye for her dedicated efforts as editor of our Scottsville Museum newsletter.